გეოეარის, ქალთა ფონდი საქართველოში და ორგანიზაცია ,,იდენტობა"-ს ორგანიზებით გაიმართა საქველმოქმედო კინო ჩვენება, სადაც ნაჩვენები იქნა ორი ფილმი და მოეწყო დისკუსია დიანა მაკკარტისთან. ადგილი: ორგანიზაცია ,,იდენტობა", რუსთაველის 37, ბინა 1.
დოკუმენტური სტილის ფემინისტური, მეცნიერულ-ფანტასტიკური ფილმი, რომელიც განიხილავს რასიზმს, კლასიზმს, სექსიზმსა და ჰეტეროსექსიზმს ალტერნატიულ აშშ-ს სოციალისტურ დემოკრატიაში. ეს არის ფილმი, რომელიც მოგზაურობს დროში, სივრცესა და მედიაში, რათა განიხილოს პოლიტიკური სუტაცია გინეა-ბისაუში. ის დადგმულია ბერლინში, Haus der Kulturen der Welt-ში და ეფუძნება ფლორა გომესის, სანა ნა ნჰადას, ჯოზეფინა კრატოსა და ხოსე კობუმბა ბოლამას 70-ანი წლების სურათების არქივს. ფილმი აჩვენებს არქივის გამოგონილ მედია ანგარიშს, სურათების სუბიექტურ კითხვას და განიხილავს მათ როლს პოსტ-აფრიკულ ლიბერაციაში. ის აღწერს და აჩვენებს, თუ როგორ შეიძლება თითქმის დავიწყებული მასალა გახდეს მეხსირების აღდგენის ინსტრუმენტი. 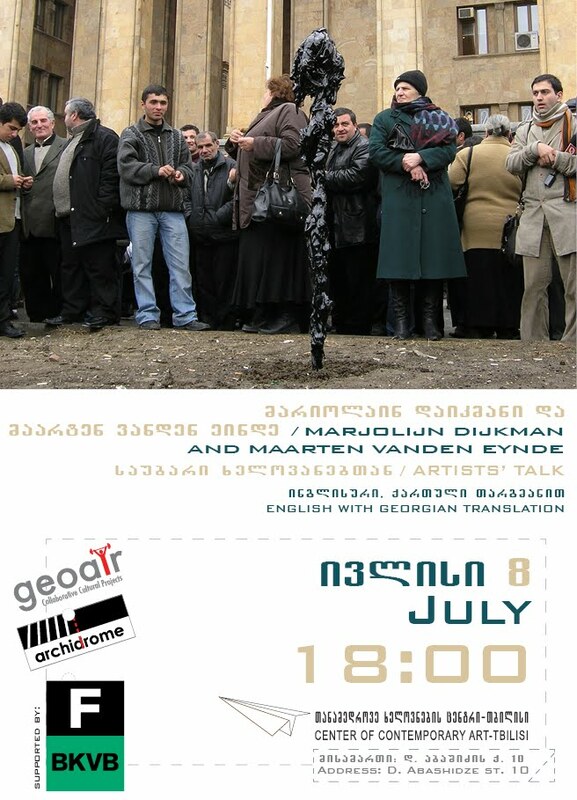 GeoAIR, Women's Fund in Georgia and "Identoba" organized a movie night, where the screening of two films were followed by the discussion with Diana McCarty. Attendance: 5 GEL as a donation. Collected money was fully used for the grant budget of Women's Fund. is a documentary-style feminist science fiction film that explores racism, classism, sexism and heterosexism in an alternative United States socialist democracy. "Luta Ca Caba Inda" (Creole T. The Struggle Is Not Over Yet), is an homage to the African Liberation Movement and Amilcar Cabral. “Conakry” is a 16 MM film that travels through time, space and media to revisit the political landscape of Guinea Bissau. Staged at the Haus der Kulturen der Welt in Berlin and based on 70s archival images of Flora Gomes, Sana na N’Hada, Josefina Crato and José Cobumba Bolama, the film layers fictional media accounts of the archive, subjective readings of the images, and questions their role post-African liberation. It describes and exposes how accessing almost forgotten footage of militant imaginary can be an instrument for recovering memory. დიანა მაკკარტი დაიბადა და გაიზარდა ნიუ მეხიკოში და 1993 წლიდან ცხოვრობს ევროპაში. კერძოდ, 90-იან წლებში ცხოვრობდა ბუდაპეშტში და 2000-იან წლებში ბერლინში. მისი ნამუშევრები უკავშირდება ხელოვნებას, პოლიტიკასა და ახალ/ძველ მედიას. ამჟამად ის მუშაობს რადიოში, ასევე, გენდერის, რევოლუციური ქალებისა და ფილმის საკიხებზე. ის არის ბერლინში, ცნობილი რადიო reboot.fm-ის თანადამაარსებელი და რედაქტორი. ასევე, დიანა არის საერთაშორისო სახელოვნებო რადიო ქსელის, radia.fm-ის თანადამაარსებელი და ქალთა, ხელოვნებისა და ტექნოლოგიის ელექტრონული ქსელის თანამოდერატორი (ქეითი რაი ჰაუფმანთან, ველი ჯორჯევიჩსა და უში რეითერთან ერთად). მისი ბოლო პერიოდის ნამუშევრებია: Prologue: New Feminism, New Europe. დიანა, ასევე, იყო International Women’s University-ს სერვერის განვითარების გუნდის წევრი (სედა გურსისთან, ბარბარა შელკესთან, პროფესორ ჰეიდი შელოვსა და ჰეიქი პიშთან ერთად), რის ფარგლებშიც ის, ასევე, მუშაობდა ტექნოლოგიასთან ფემინისტური პედაგოგიკის სწავლების მიდგომების განვითარებაზე. 90-იანი წლების შუა პერიოდში, მან, გირთ ლოვინკთან და პით შულთზთან ერთად დაარსა Nettime და როგორც Media Research Foundation-ის ნაწილს, ორგანიზება გაუწია MetaForum-ს, კონფერენციათა სერიას ბუდაპეშტში (იანოს შუგარსა დ აგირთ ლოვინკთან ერთად). ის იყო Mikro e.V თანადაამრსებელიც. დიანა მუშაობს ხელოვანებთან, წერს მათი ნამუშევრების შესახებ და იყო Nettime Medien Zentral Kommittee readers თანარედაქტორი. მისი ძირითადი ინტერესია სოციალური და ტექნოლოგიური სისტემების გამოყენება კულტურასა და რეალურ ცხოვრებაში. ჩემი რეზიდენციის პერიოდი თბილისში, დაეთმობა საქართველოს ახლანდელი, ძველი და მომავალი ფემინიზმისა და ქალთა აქტივიზმის კვლევას. ასევე, შესაბამისი ფილმების გაზიარებასა და ხსენებულ თემებთან დაკავშირებით, მომავალი თანამშრომლობისათვის პარტნიორების მოძებნას. Was was born and raised in New Mexico and have lived in Europe since 1993 - Budapest in 90's and Berlin in the 2000s. Her work revolves around art, politics and new/old media. Currently, she works with radio, gender and revolutionary women and film practices. She is an editor and co-founder of the award winning artist run radio reboot.fm in Berlin, a co-founder of the international radio art network, radia.fm and a co-moderator of the faces on-line community for women, art and technology (with Kathy Rae Huffman, Valie Djordjevic, Ushi Reiter). Past projects in include Prologue: New Feminism, New Europe, with plans for future implementaitons. A long time ago, McCarty was part of the International Women’s University server development team, (with Seda Gürses, Barbara Schelkle, Prof. Heidi Schelhowe, and Heiki Pisch) - and also worked to develop feminist pedagogical approaches to learning technology. In the mid-nineties, she co-founded the Nettime (with Geert Lovink, Pit Schultz) and as part of the Media Research Foundation, co-organized the MetaForum Conference Series in Budapest (with Janos Sugar and Geert Lovink). She was a co-founder of Mikro e.V. and the now defunct cultural hacker space, bootlab, in Berlin. McCarty works with artists, occasionally writes about their work and has co-edited the Nettime Medien Zentral Kommittee readers. Her main interests are exploiting social and technological systems for culture and real life. Diana's residency in Tbilisi was spent researching present, past and future feminist and women activists in Georgia, sharing related films and looking for partners for future projects that relate to all of this. Diana McCarty thanks to the Institut für Auslandsbeziehungen (ifa) in Germany for their kind support of travel and costs, and the GeoAIR residency program for hosting her.